using your home sewing machine. There are no complaints about the pop-up rainstorms that passed through Chattanooga on Saturday. Goodness knows, our crunchy, yellowing lawns and parched gardens need watering! If you don't have to be out driving—or walking—in those kinds of downpours, the best place to be is in the classroom of a quilt shop, learning how to free-motion quilt! That's exactly where I was... all day Saturday... at Pins and Needles Quilt Shop... in Chattanooga... along with a fun group of quilters who wanted to use their home sewing machines, thread and their creative energy to turn two-dimensional quilt tops into three-dimensional finished quilts that can be shared and enjoyed. Yes, my Into to Free-motion Quilting class is a full day. Why? Because we cover more than just the mechanics of moving the quilt sandwich under the needle with the feed dogs dropped. And this Saturday's group of excited, inquisitive students were full of questions, wonder and "ah-ha" moments throughout the day with lively discussions about stitching in the ditch and other quilting terms, thread weights, needle sizes, needle types, batting fiber content, and other topics related to having success with free-motion quilting. Students practicing free-motion designs on paper. 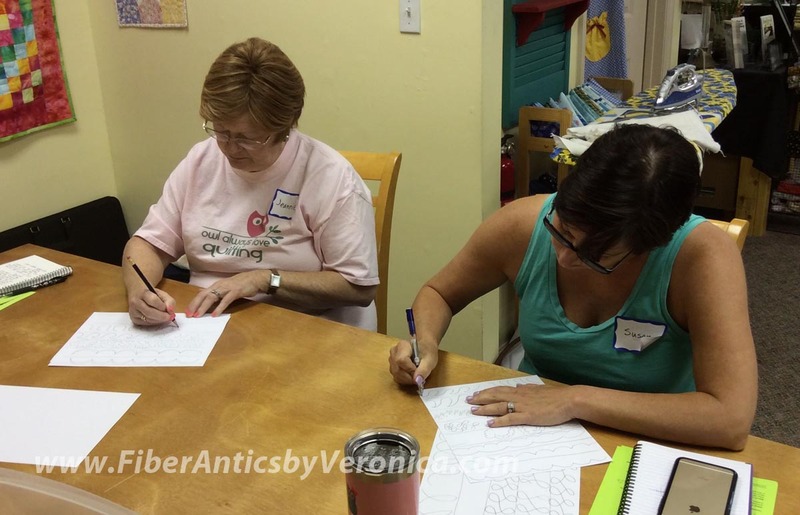 After a slide presentation about quilting terminology, we worked on drawing exercises. Drawing quilting designs on paper. Practice quilt sandwiches are then prepared and the stitching begins. You know you are in the right place when one of the students throws her hands in the air and exclaims, "I'm having fun!" in the classroom of the quilt shop. 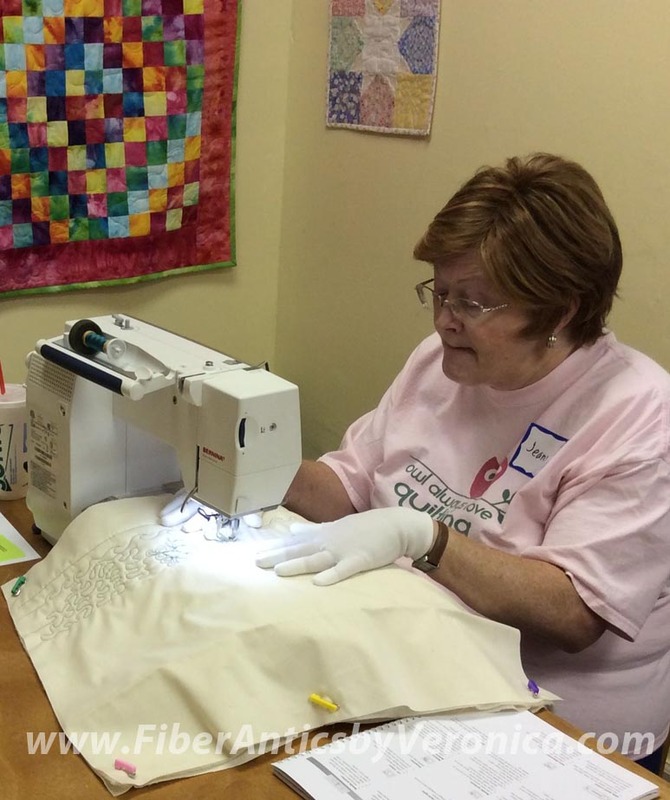 There were several questions in this class about handling a larger, bed-size quilt under the arm of a domestic sewing machine. 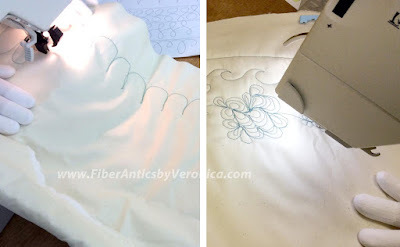 In class, I talk about setting up your sewing space to help with this, and also demonstrate maneuvering a large quilt under the needle with a bed-size quilt that I bring for class Show and Tell. Remember, quilters: Be patient and eat that elephant one bite at a time. If you want to practice FMQ and get some experience under your belt before tackling a bigger quilt, make some Kitty (or Doggie) Cuddle Quilts for a local shelter or clinic. Ideas for making these little quilts are here and here. Black kitty, Roderick, approves a Kitty Cuddle Quilt at the Cat Clinic of Chattanooga. 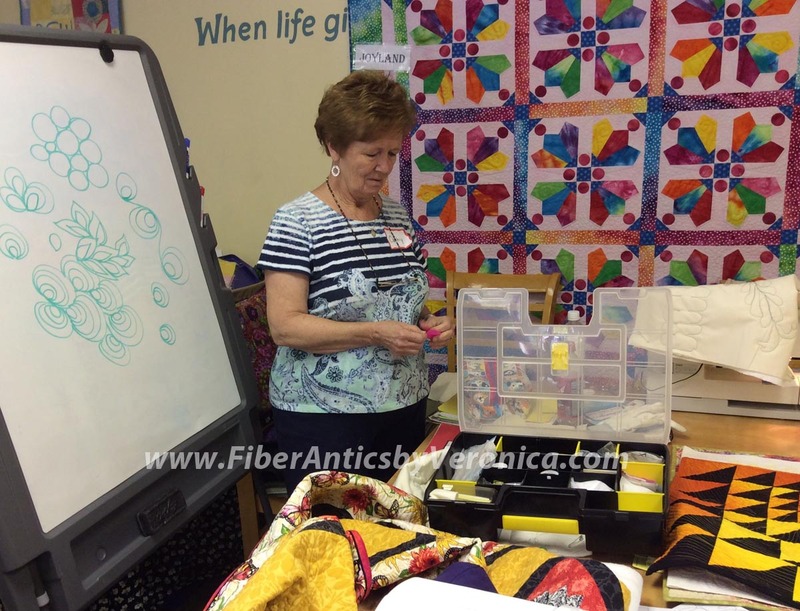 It was great to be back in the classroom again teaching Free-motion Quilting this past weekend. While Mother Nature was nourishing our lawns, flowers and vegetables, my students and I were inside the quilt shop, surrounded by colorful fabrics, inspiring quilts and were feeding our creative souls and minds by learning a new skill—free motion quilting—using the our home sewing machines. 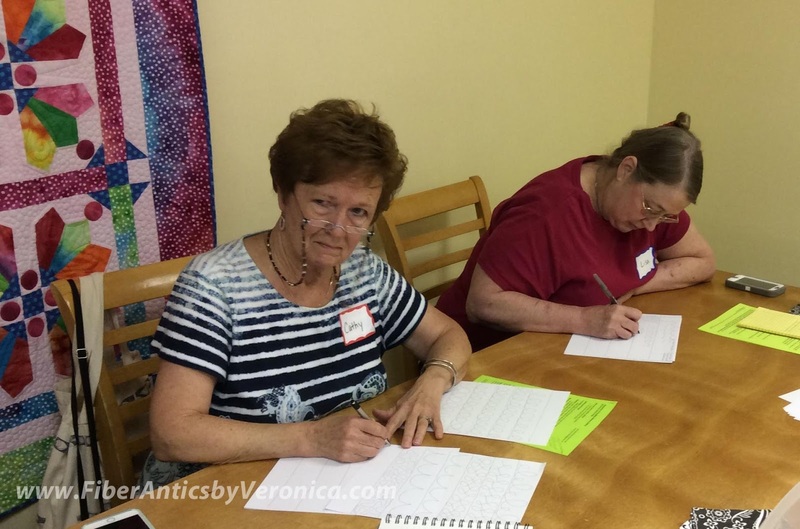 Thanks for a great class, ladies!